The Messages app received a significant makeover in iOS, and like many other elements of iOS some of it’s functionality changed as well. 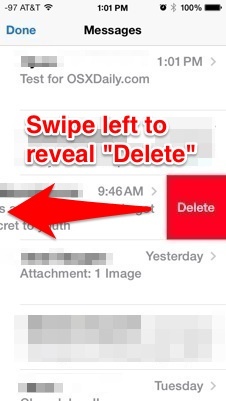 Many users have noticed that the behavior to delete messages has changed, leading some to believe the deletion feature was removed from Messages entirely (it wasn’t). Let’s review how to remove segments of message threads in iOS 11, iOS 10, iOS 9, iOS 8, and iOS 7, and also how to delete an entire message conversation from the app completely. 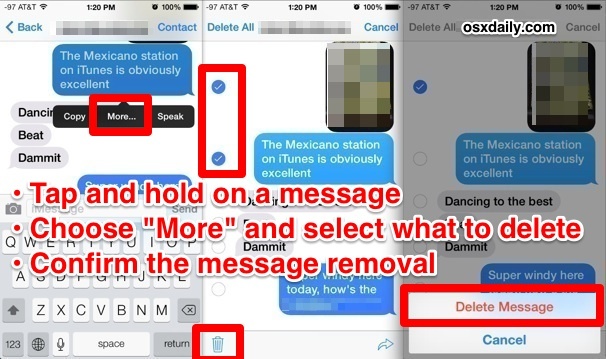 Removing a message works the same for iMessages, multimedia messages, and for standard SMS text messages. To prevent any mistakes, you may want to adjust the setting to show full names within Messages before modifying or removing them. The primary difference between how this works now post iOS 7 versus Messages prior to iOS 7 is the removal of the “Edit” button, which has now be transformed into part of either the tap-and-hold trick mentioned above, or as a gesture which we’ll cover next. If you’d prefer to delete an entire message thread, you can do that too, which is actually much easier than removing parts of a conversation. Unlike removing segments of conversations, deleting the entire conversation has no confirmation, so be sure you want to delete the entire thread before continuing. The removal of buttons is widespread throughout iOS after the 7.0 release, and like in many places there has been a move to gestures instead, whether it’s quitting out of apps, unlocking the screen, deleting emails and messages, or searching spotlight. newest ios on iPhone 8+ doesn’t do this. Holding the picture for several seconds pops up a box surrounding the picture and a more button at the bottom allows you to save or share. No delete. Then I discovered after 2-3 seconds, you can slide the picture up and it brings UP another set of choices including delete, but no sidebar and way of doing multiple pictures. Only one at a time. Also as soon as I lifted my finger from the picture to hit the delete button, it closed and went back to the picture. I had to have my wife push the delete button. Very TIME CONSUMING!! !